The arborists will be in at Harrison’s Rocks during the week 5th – 9th November 2017 to cut the next compartment – below the climb “Sliding Corner”, just before you get to the Luncheon Shelf area. Harrison’s Rocks Management Group (HRMG) have asked for SVG help with the clearance of arisings on Saturday 10th and Sunday 11th November 2018. There will be a nominated event coordinator on each day – Sarah Cullen on Sat 10th and Adrian Paisey on Sunday 11th. Please report to them in the car park prior to the event briefing and also ensure that if you arrive later, you report to them before starting any work. The plan is to meet in the car park at Harrison’s at 09:30 on each day where there will be a full briefing, explaining what work is to be done, where the work is and giving a full safety briefing. The last part is important and particularly so for those who may join later. If that applies to you, please find the person in charge before starting any work. 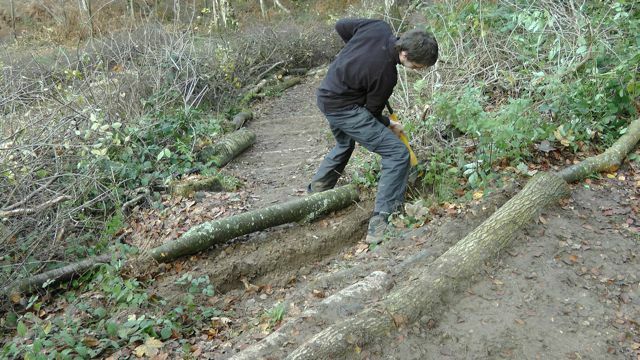 The work will be clearing the arisings from the cutting, moving the trunks to habitat piles or where they are required for revetment work and lining footpaths with the brash. There will also be other work cutting back Sycamore and other saplings that have re-grown in areas cut in previous years. Consequently, there is plenty to be done and a good turnout would be very much appreciated. Parking is £4 a day at Harrison’s and it would help if you could share transport. The BMC will cover reasonable parking costs – please retain your ticket and let the person in charge on the day have them after the day’s work so that we can recover the costs. As in the past, if you have a bowsaw, loppers, pruners etc. please bring them along but there is plenty of work to be done that doesn’t require tools. Old clothes and boots, gardening gloves and waterproofs if it’s wet. Please don’t wear your best ‘Arcteryx’ gear! Bring a packed lunch and a drink please! We will have a qualified first aider on site both days but if you have first aid qualifications, please let the day’s event coordinator know. Any questions, please ask but more importantly, please let me know if you are able and willing to help. In June there was an announcement that the BMC Land Management Group would like to hold a special meeting to make extra assessments regarding the proposed installation of the bridge onto Isolated Buttress. The Meeting is to be held on Sunday 7th October 2018 in the Bar at Bowles Rocks. The LMG want to be transparent and clear about the process on October 7th and beyond, so please bear the following in mind:The format of the Isolated Buttress part of the meeting will be that the HRMG will briefly remind the room how it came to its decision, after which the floor will be open to anyone to speak. The LMG will only consider any new compelling arguments that haven’t already been discussed, given that the HRMG have already debated at length the merits of both sides of the argument. Only four members of the LMG are able to attend the meeting so the final decision will be reserved until a teleconference can be held in the week following the Open Meeting with more LMG members. A decision will be taken over the teleconference, following an update on the meeting from those present and necessary discussion.All are invited to attend and comment in person concerning the decision-making process concerning access on and off Isolated Buttress. Following a long process of meetings, discussions and opinion gathering the decision has been taken to erect a bridge to connect the Isolated Buttress to the mainland. Some three years ago the boulder by the ‘step across’ was removed for safety reasons, making access a problem for many climbers. This is a decision that all HRMG members will support with the backing of the BMC. Work will commence on the bridge early in 2018. The BMC has released a statement concerning the decisions and can be found here. Hi All… Please consider coming out to Harrison’s on the Sat or Sun and helping with this task. 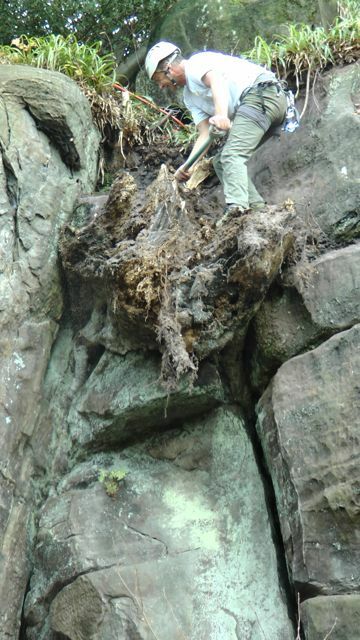 The arborists will be in at Harrison’s Rocks during the week 6th – 10th November 2017 to cut the next compartment. Therefore, we need help with the clearance of arisings on Saturday 11th and Sunday 12th November 2017. The plan is to meet in the car park at Harrison’s at 09:30 on each day where there will be a short briefing, explaining where the work is and what needs to be done. There will also be other work cutting back Sycamore and birch saplings that have re-grown in areas cut in previous years. Parking is £4 a day at Harrison’s and it would help if you could share transport. The BMC has, in the past, paid for the parking – please retain your ticket and let the person in charge on the day have them after the day’s work so that we can recover the costs. Any questions, please ask but more importantly, please let me know (by return email or text) if you are able and willing to help. Paying for parking and camping was all part of the deal when the Forestry Commission took over the management of the toilet block, car park and camping at Harrison’s Rocks. A few years back when it was first announced that the toilet block was to be closed and then potentially demolished, there was an uproar from the south-east climbing community. Without the toilet facilities the campsite could not stay open. The Forestry Commission agreed that the money raised from the parking fees and camping, would go towards the upkeep of the facilities which the climbing community fought so hard to keep. It has been noticed that some visitors have not been paying for their camping. They may have a valid yearly parking ‘discovery pass’, which allows them to park in the car park, but as soon as they stay overnight, it is deemed as camping, so a camping charge is needed to be paid at the machine. The upkeep of the camping is important and costly, mainly due to the facilities used by visitors staying over night; water and electricity from the toilet block usage are costly for the Forestry Commission, as well as regular refuse pick-ups from the large bin in the car park. Please take all this into consideration when staying at Harrison’s. With the Forestry Commission’s budget already stretched, all visitors need to pay in order to secure the future of the facilities. If people continue not to pay for camping in 2018 then there is a very strong risk that the campsite and potentialy certain aspects of the facilities, will close. The following may be of interest in view of the upcoming discussion and, I guess, a decision on the Harrison’s Rocks Isolated Buttress bridge proposal due to take place at the Sandstone Open Meeting on Sunday 8th October 2017 in the bar at Bowles Rocks, starting 18:00. How to protect Southern Sandstone while enjoying its unique, esoteric climbing. The BMC have just launched a newly updated booklet giving advice on how to minimise your impact whilst climbing on Southern Sandstone. Home to many unique and much loved crags, (many of which have been proving grounds for some of the UK’s top climbers) and given its proximity to so many people in the south east the crags of this area are incredibly popular and for good reason. However given the very soft nature of the rock, anyone climbing on these crags needs to be aware of a number of different things to ensure a great day out on the rock without damaging the routes. This booklet tells you everything you need to know for a great day out whilst looking after the rock for current and future generations. 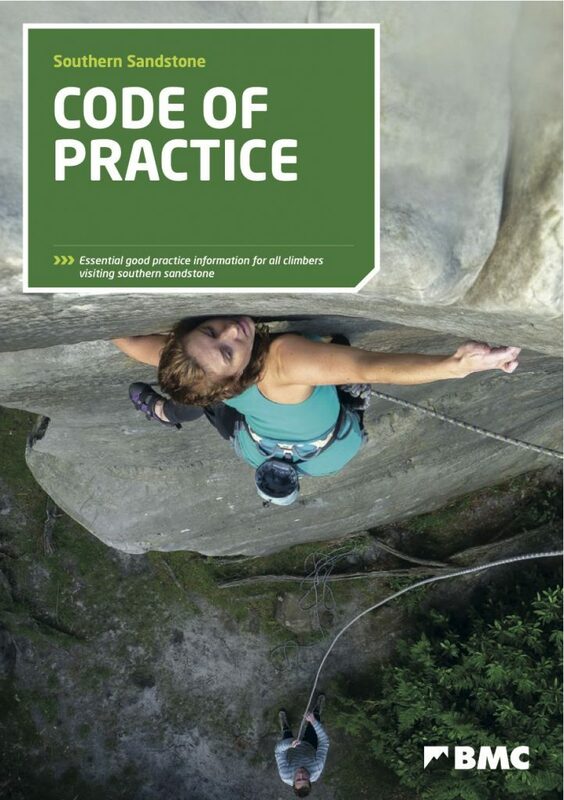 The Southern Sandstone Code of Practice is now available as a download or hard copy from local walls or through the BMC Shop. This year’s tree work at Harrison’s rocks takes place over the last full week of November and we are asking for help to clear the arisings over the weekend of Saturday 26th and Sunday 27th November 2016. There is plenty to be done so please come out and help with the work – putting something back into the climbing environment. If you can come out to help, please let me know (by replying to this email) which day(s) you can help. If you have the usual bowsaw, swop hook, pruners etc. please bring them along but it’s not a precondition! Wellies/boots and suitably old clothing are the order of the day with a packed lunch and a drink. After a year of monitoring the Isolated Buttress at Harrison’s Rocks it was discussed at length again at the Harrison’s Rocks Management Group meeting on 19th October. It was recognised that during the the past year, some damage had been done to the rock by climbers heavy use of the traverse across and evidence had been collected of some people abseiling back down. Strong views were expressed regarding building a bridge but once again there were strong arguments on both sides. During the monitoring stage, it was noticed that an access rope had been left up by local climbers (with the best of intentions), to aid people across the traverse. In some cases but not all, the rope was rigged through the bolts or was not being taken down at the end of the day. Obviously this was a concern to the HRMG, and the BMC and HRMG have deemed that any method in which a rope is used through the bolts for a traverse will put undue strain on the bolts in a sideways force and therefore is deemed to be an unsafe method of access (see story here about bolt testing and how to load bolts correctly). A sign will be going up to inform climbers to not use the bolts on the buttress for anything other than top-roping. It was discussed at the HRMG and the Sandstone Open Meeting that another year of monitoring without these ropes being put in place would be the best choice. Without these ropes being left in place by good-willed climbers, it is hoped it will make those less experienced climbers appreciate the full extent of the access situation to and from the buttress. It would allow climbers to use their own judgment on their own safety. It is thought that with less on-hand guidance and access, this would then give an accurate picture on what the majority of climbers would do to access the buttress. Minutes of the most recent meeting are available on the Sandstone Open Meetings page. Volunteers from the HRMG (Harrison’s Rocks Management Group) have been testing the in-situ bolt anchors at Harrison’s and Stone Farm Rocks. Harrison’s has a total of approximately 180 pairs of bolts and Stone Farm has 23 pairs. It took the team a total of 8 hours to test all the bolts at Harrison’s Rocks. Bolts are tested on a regular basis for movement and stress when under load whilst belaying from below. They are placed specifically for the safety of climbers and should never be used for any other activity. The owner has recently banned bouldering at the Rocks and has imposed further restrictions on times when climbing is allowed – the details are on the High Rocks website. All climbers should respect the current access arrangements to avoid further restrictions or the possibility of a total ban. Thanks to those who are coming out on Saturday to help at Harrison’s. 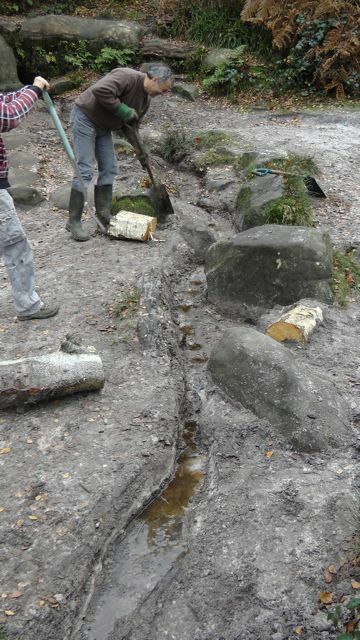 We currently have around 8 for Saturday 7th and 1 for Sunday 8th but really need more to make the day worthwhile and be sure to get the arisings cleared and, where possible, carry out some much needed revetment work. If you are willing to lend a hand, please let me know so that I have some idea of numbers but please do not be discouraged from simply turning up and lending a hand! The compartment is ‘D’ – the area from North Boulder to Eyelet – essentially the first area to the left as you pass the North Boulder. We’ll be there from 09:30 on Saturday and Sunday. If you have a Bowsaw it’ll be useful, as will long-handled loppers for trimming trunks and a pair of gardening gloves will protect your hands a bit as well… but it’s not necessary to bring anything! If you are visiting Stone Farm be aware that there is a bee’s nest in the base of the tree above ‘Remote’. The Isolated Buttress needs YOUR help ! Following the Sandstone Open Meeting last weekend, some strong views opposing a bridge as a solution to the Isolated Buttress access issue were expressed, and so the Harrison’s Rocks Management Group will be assessing the situation over the summer to determine a long term solution. This does not mean that in the meantime the Sandstone Code of Practice can be ignored ! Today all those seen climbing on the Buttress were abseiling off. If you see anyone lowering off or abseiling on the Buttress, please ask them to adhere to the Sandstone Code of Practice. It is vital that we protect this block from damage caused by lowering off and abseiling. Signs have gone up today with the following information. IF YOU ARE UNABLE TO ACCESS OR RETREAT FROM THE BLOCK SAFELY PLEASE CLIMB ELSEWHERE. PLEASE READ THE SIGNS AT THE TOP OF THE ROCKS AND AT THE CAR PARK FOR KEY POINTS OF SANDSTONE CODE OF CONDUCT. THERE IS A MORE COMPREHENSIVE CODE OF CONDUCT IN THE CLIMBERS’ CLUB SANDSTONE GUIDEBOOK. The access road into Birchden Wood will be closed to traffic all day on Tuesday the 19th of May to allow the final surface dressing to be laid down. This is dependent on the weather as the dressing can’t be laid when it is wet. If the weather does cancel the operation an update will be posted on the Birchden Wood web page as soon as we know. The campsite at Harrison’s Rocks / Birchden Wood is now officially open. The infrastructure isn’t yet in place to collect camping or parking fees so there won’t be a charge for camping over the next few weeks. However, please be aware that income collected via a pay and display system will be vital for the upkeep of the facilities on which the campsite depends. When charging does start the Forestry Commission will give a suitable period of notice and will ensure signage is in place to let people know. As well as a daily charge a reasonably priced annual season ticket is proposed. If you are planning to use the campsite at Birchden Wood please download a copy of the camp site rules (see link below). The boulder on the landward side of the Isolated Buttress, used to access the top of the block, had become increasingly unstable in recent weeks and a decision was taken, due to the possibility of a potentially lethal accident occurring, to render it unusable. Measures are being taken to set up an alternative means of access. Meanwhile it is recommended that a route is soloed. Boulder Bridge Route (2b) is considered to offer the easiest start but will require a traverse to the top of Crowborough Corner to finish. The Sandstone Open Meeting was held at Bowles Rocks bar on Sunday 5th October 2014 There was plenty to discuss with continuing issues at Harrison’s and present problems at High Rocks and there was some discussion on the Sandstone Code of Practice. There’s currently a thread on UK Climbing that’s related… http://www.ukclimbing.com/forums/t.php?t=596581 . HRMG have organised the cutting of compartment ‘C’ at Harrison’s during the week commencing 24th November 2014. Consequently, the SVG will be out the following weekend of Saturday 29th and Sunday 30th November 2014 to clear the arisings, create habitat piles and carry out revetment and path maintenance work. We need volunteers to help on both the 29th and the 30th Nov – if you can help, please let Graham Adcock know so that he has an idea of numbers. Work has now progressed to the point where the block is now usable again and is open to the public. The camp site will also be open – the current charge is £4 per night. The future management of the block, campsite and car park will be decided in November.